Chocolate. Red wine. What else do you need? I know I like chocolate, and I like red wine, and I like both together. 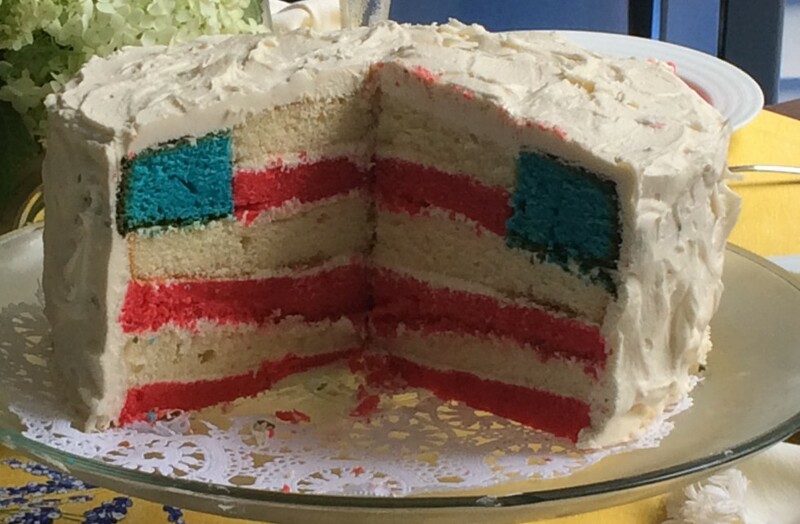 So how can this cake go wrong? 3/4 cup unsweetened cocoa powder (not Dutch process)* plus some for dusting. 1. Preheat the oven to 350°. 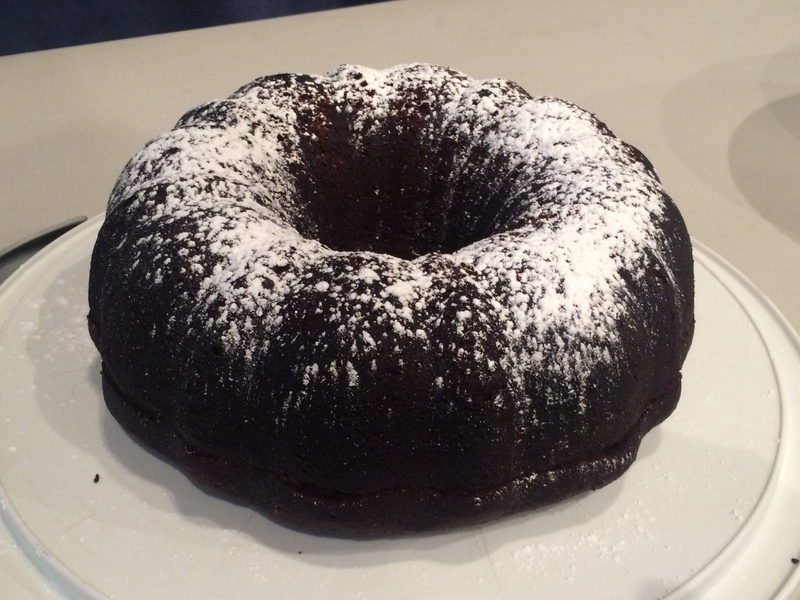 Butter and dust a 12-cup Bundt pan with powdered cocoa. In a medium-sized bowl, whisk the flour, cocoa powder, baking soda and salt. 3. Scrape the batter into the prepared pan, and bake for 45 minutes, until a toothpick inserted in the center comes out clean. Let the cake cool in the pan for 10 minutes, then turn it out onto a rack; let cool completely. Dust the cake with confectioner’s sugar and serve with whipped cream or ice cream. 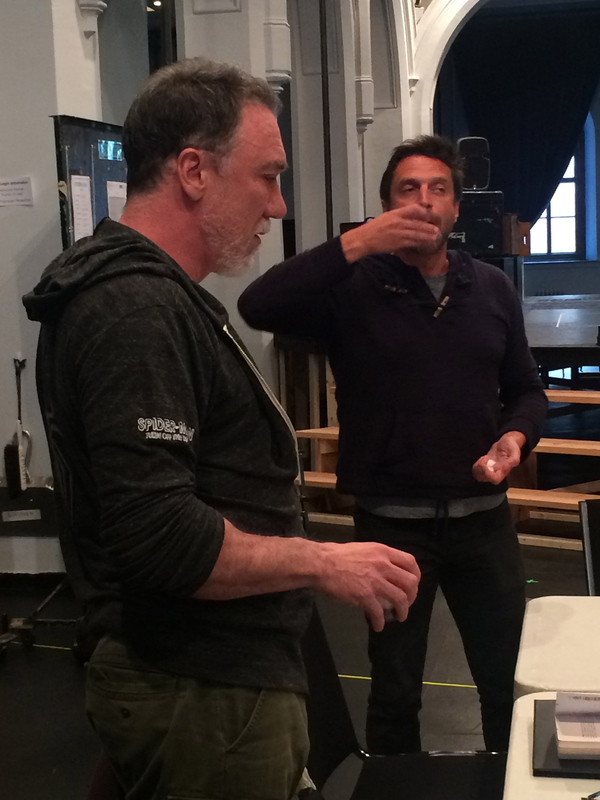 Patrick Page, who plays Cymbeline, and Raul Esparza, who plays Iachimo, taking their wining and unwinding very seriously. *What is Dutch process cocoa? What is non-Dutch process cocoa? And why does it matter? Non-Dutch process is simply natural cocoa powder: the dry, solid remains of fermented, dried and roasted cacao beans that have been ground into a fine powder. It is slightly acidic with, if you’re a complete nerd, a PH between 5-6. Dutch process, on the other hand, is natural cocoa powder that has been washed with a potassium carbonate solution to alkalize it slightly. Who cares, right? 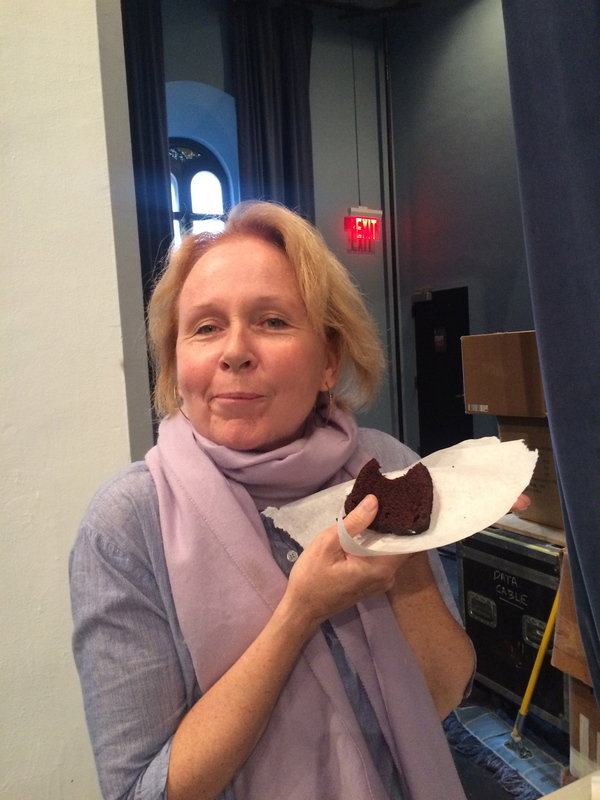 And what difference does it make to my cake? Anyway, long story short, you really can use either kind of cocoa no matter what, but to make the ideal version of whatever you’re baking, stick to what the recipe says.